A dig at the suspected birthplace of the Buddha has led to the discovery of an unknown timber structure beneath a series of brick temples. Remarkably, it's the first known archaeological evidence linking the life of the Buddha to a specific century. According to the best historical accounts, Siddhartha Gautama — otherwise known as the Buddha — was born to Queen Mayadevi in Lumbini, a district of Nepal. The site, which was re-discovered in 1896 by Nepalese archaeologists, has become one of four sacred pilgrimage points associated with with the life and times of the Buddha, the others being Kushinagar, Bodh Gaya, and Sarnath. Lumbini was designated a UNESCO World Heritage Site in 1997. 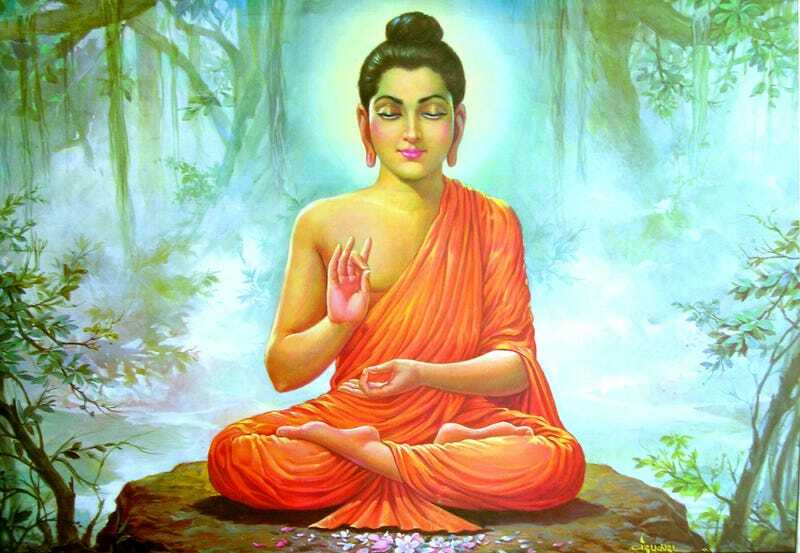 It's thought that Gautama Buddha was born sometime around 563 BCE and died around 483 BCE. But there's no consensus on this, with some historians claiming he was born in the fourth century BCE and died as late as 380 BCE. The problem is that no historical or archaeological records about the Buddha have been found from his lifetime. The only thing that's known about him comes through textual sources and oral tradition. A Man of the Sixth Century B.C. But the new excavations in Nepal have the potential to rewrite the books on this important period of history. It now appears that the Buddha lived as early as the sixth century BCE. Professor Robin Coningham of Durham University, U.K., who co-led the investigation, confirmed these dates after uncovering a previously unknown chamber containing the remains of a tree shrine within the Sacred Garden of Lumbini. According to Coningham, the ancient timber shrine appears to be the inspiration for the brick Maya Devi Temple built on top of it — a strong indication of continuity of worship at the site. And remarkably, the wooden structure features an open area where a tree once grew. Buddhist legend has it that Gautama was born under a tree at the sacred Lumbini compound, making the newly discovered temple — which is the oldest Buddhist shrine — all the more profound and intriguing. Digging beneath a central shrine, the researchers uncovered postholes pointing to a wooden railing surrounding a tree shrine and dating to around 550 B.C....They also found an older brick structure. To establish the time pieces for the various artifacts found — like pieces of charcoal, grain, and sand — the archaeologists used radiocarbon dating and optically stimulated luminescence techniques. The international team of archaeologists, who were given special permission to dig at Lumbini, were comprised of Japanese and Nepalese officials and overseen by UNESCO. Why were the Nazis so interested in a statue carved from a meteorite? Today, some half a billion people around the world are Buddhists, and by 2020, some 22 million Buddhist pilgrims are expected in South Asia. It's the only major religion that doesn't believe in God or the soul, and it considered by some to be the 'religion' of the future. Dalai Lama tells his Facebook friends that religion "is no longer adequate"
Details of the findings will appears in an upcoming issue of Antiquity. Sources: UNESCO, National Geographic. Images: Ira Block — National Geographic.